Haemorrhagic strokes are more accurately called Spontaneous Intracerebral haemorrhage(SICH) can often be sudden and devastating. They make up approximately 15% of all strokes. Aneurysmal SAH usually goes to the neurosurgeons initially and will be discussed separately. Mortality is high for those with large bleeds with up to 30-50% of patients dying within 30 days. However many patients with small bleeds can do well and make good recoveries and then the emphasis is on looking for causes that will help prevent further episodes. Note that Traumatic induced ICH is not regarded as stroke. 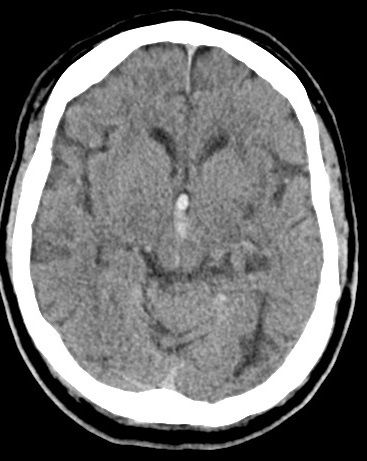 Subdural haemorrhage is "extra-axial" and also not classified as stroke. Haemorrhage can result from vessel rupture at any point in the vascular tree from the main artery coming of the circle of Willis to small penetrating arteries and arterioles, capillary beds and to draining veins. The largest will be the rupture of Berry/Saccular aneurysms but these tend to cause high-pressure bleeding as seen in the classical SAH. 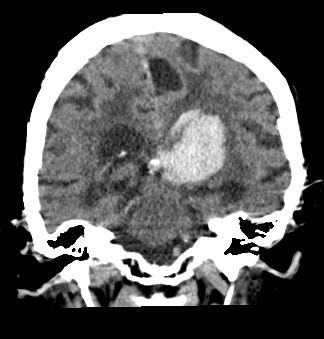 Rupture of smaller intraparenchymal vessels arterioles and smaller vessels can cause intracerebral haemorrhage. Various aetiologies exist from amyloid angiopathy to lipohyalinosis and microaneurysm formation and hypertension. Structural anomalies such as arteriovenous malformations and cavernous angiomas (Cavernomas) can also bleed. Disorders such as hereditary haemorrhagic telangiectasia. Other causes include tumours and some have a tendency to bleed. Coagulopathies cause or exacerbate bleeds and these may be related to clotting defects which may be due to the use of antiplatelet drugs or Warfarin or DOACs or heparins or simply liver failure or haemophilias or thrombocytopenia. Often times risk factors such as a hypertensive bleed on an anticoagulant can appear to exacerbate what may have been a limited haemorrhage as haemostasis is difficult to achieve. 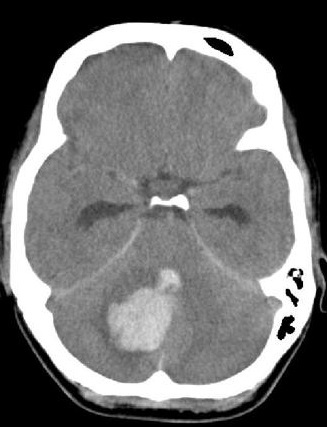 Haemorrhage is locally destructive causing tissue damage and haematoma formation and pressure necrosis and even infarction in surrounding brain. Secondary effects include bleeding into and obstruction of the ventricular system. 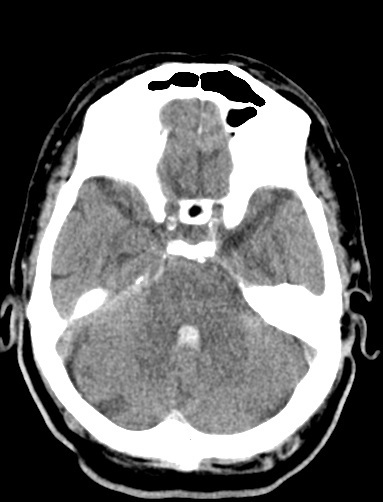 Venous sinus thrombosis obstruction and resulting back pressure can result in intraparenchymal haemorrhage but this appears to be due to back pressure rather than vessel rupture so paradoxically patients are cautiously anticoagulated. Haemorrhagic strokes make up a slightly higher proportion of all stroke cases in those of Afro-Caribbean origins. They also appear to be more prevalent in those from South East Asian and Japan. There may well be underlying racial and genetic differences and incidence of hypertension. Cavernomas showing the popcorn appearance on T2 and with a rim of blood. It can be seen showing black blood on SWI. Caveromas do not appear enhanced on angiography. The main causes of haemorrhagic stroke are listed below. They depend very much on the age of the patient. For example cerebral amyloid angiopathy is largely a disease of the older generation (over the age of 70) and along with hypertension is the commonest cause of bleeds in the elderly. In younger patients structural lesions are all the more common such as AVM and even berry aneurysms. Other causes of stroke include the ever-increasing use of anticoagulation particularly with Warfarin but also the newer agents such as Dabigatran, Apixaban and Rivaroxaban. So, begin to think of why immediately. The patient on anticoagulants will need immediate reversal of the coagulopathy as quickly as possible. One of the main differentials when seeing a patient with an unclear history found on the floor with retrograde amnesia and intracerebral haemorrhage is which came first the bleed or the fall. 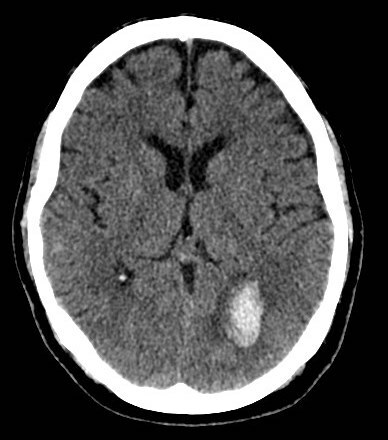 A deep bleed is likely to be hypertensive but a lobar bleed especially with overlying soft tissue swelling on the CT skull or a fracture may suggest the fall came first and the blood is due to a head injury. There is quite a lot of evidence with serial scans that bleeding continues over hours and that haematomas can continue to expand. Any coagulopathy should be corrected. Once a hemispheric bleed reaches a volume of about 60 mls the local compensatory mechanisms fail and there is pressure on the brainstem which leads to coning and death. There is probably more space for haematoma expansion with a less marked rise in ICP in older patients with generalised atrophy. Acute Intracerebral Haemorrhage often causes acute hypertension which can worsen bleeding - careful reduction from very high levels (sustained over 180 mmHg) but not too much or this may lead to cerebral hypoperfusion and further insults. Sometimes small bleeds precede larger bleeds and this is particularly important with subarachnoid haemorrhage where the patient presents with a bleed and sustains a fatal rebleed several days later. The emphasis here is to get the patient to neurosurgery to stabilise the aneurysm with coiling or clipping. Vasospasm which can mimic an ischaemic stroke can also be seen post-SAH. Cerebral AVM can also rebleed. Complications with intracerebral bleeds include raised ICP and hydrocephalus, coning as well as seizures. As we have discussed elsewhere bleeds have a higher incidence of presenting with a headache or coma in addition to lateralising signs. 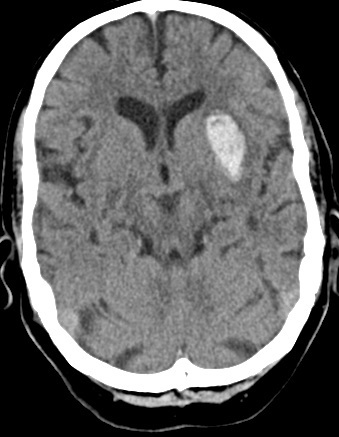 The neurology due to an enlarging haematoma may slightly cross vascular boundaries which usually restricts and limits infarction. However all attempts to use clinical signs to differentiate infarction from haemorrhage are not reliable enough to base management on and an early CT is needed in all cases. Those with large bleeds can present with deep coma and blown pupils and will have a very poor prognosis and a small subset will not even get to hospital or survive to leave the emergency department. Those with SAH will tend to present with an episode of collapse and/or thunderclap headache and be obtunded or comatose. 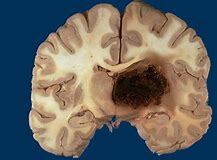 Intraventricular extension associated with headache and sudden deterioration and coma. Head Trauma and secondary bleeding: - look for soft tissue injury. Can be difficult sometimes to work out did patient fall and hit head and have bleed or did the bleed come first. The pattern of bleeding tends to be different and does not fit the typical pattern of amyloid or hypertension. There may well be subarachnoid extension or subdural bleeding. 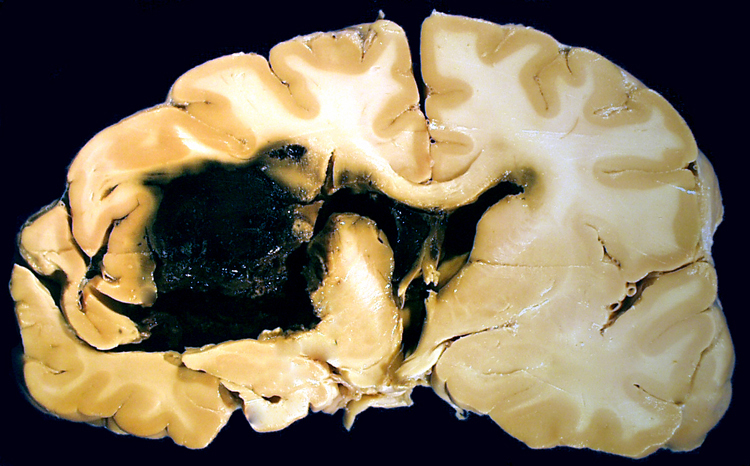 There may be superficial cutaneous haematomas suggesting direct skull trauma. One may see classical contre-coup injuries and bleeding. Any bleeding is made worse by co-existing antithrombotic medications. Tumours with Haemorrhage: - primary or metastatic. If there is suspicion then arrange MRI or CT with contrast once the haematoma has resolved. Metastatic tumours that are more often associated with bleeding include Choriocarcinoma, Melanoma (check skin), Lung cancer, Thyroid carcinoma and Renal cell carcinoma. As with ischaemic stroke it is not enough to simply diagnose haemorrhage without considering the likely pathology behind it, particularly so in the younger patient. The underlying aetiology may be anything from bleeding within a small tumour mimicking stroke to a vascular anomaly or even a venous infarction with haemorrhage requiring anticoagulation. In most cases of those over the age of 70 the diagnosis will be that of longstanding hypertensive disease or amyloid angiopathy or a mixture of both. Hospital post mortems are becoming much less common and so preciseness in the diagnosis in these cases is difficult and various criteria have been set to give a degree of precision about the diagnosis. In recent years advances particularly in imaging have led us to the discovery of 'microhaemorrhages/microbleeds'. Their exact importance and risk to patients is a subject of much research. One of the difficulties is that often the same patients are at risk of both thrombosis and haemorrhage and a weighing up of maximising therapeutic benefit and reducing harm is proving challenging. The last decade has also seen advances in the understanding of those with haemorrhagic stroke who may benefit from surgery. The evidence base continues to grow and clinicians continue to try to use this evidence most effectively for patients. Here we shall discuss the various causes and effects of haemorrhagic stroke. Tests tend to be much fewer and the differential easier than ischaemic strokes. In the older patient with a lobar bleed due to suspected amyloid angiopathy there may be no reason to do any further imaging. In a younger patient it would be vital to get MRI/MRA or CTA or CT angiography if is there was any concern about an underlying vascular anomaly at risk of bleeding again in the future. The usual range of testing is shown below. Bloods: FBC, CRP, ESR, Glucose, U&E (Hyponatraemia with SAH). LFTs. 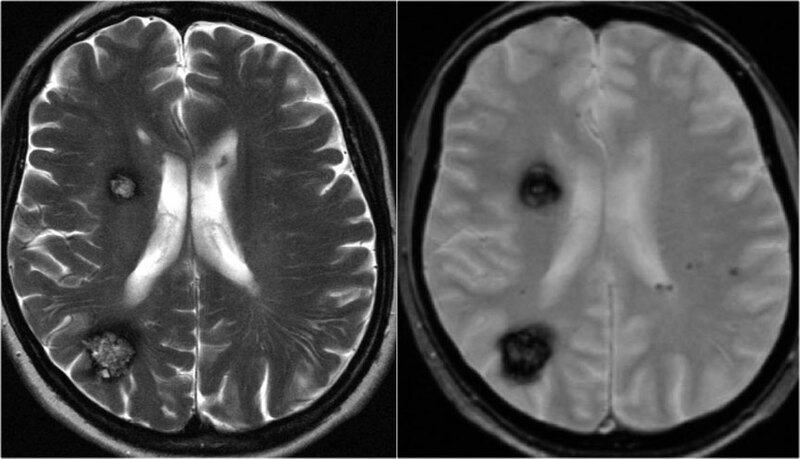 MRI: Imaging : Almost as good as CT initially but most helpful after the first week when the haematoma has resolved. 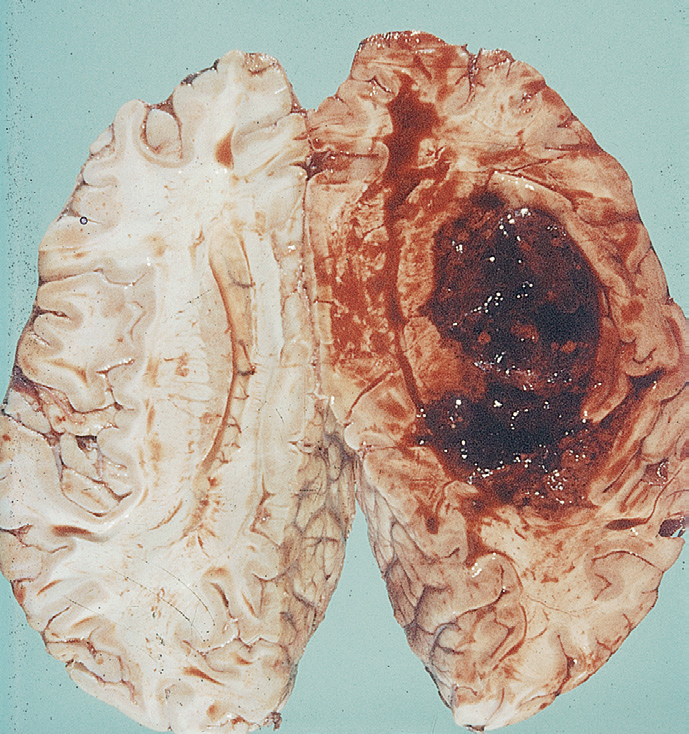 Old bleeds show a slit like appearance with signs of haemosiderin. Repeat interval scan at 6 weeks can help exclude an underlying lesion. It is useful now to do the so called 'black blood' sequences where blood breakdown products appear black. Gradient echo or T2 * (T2 star) sequences are useful. MRA: Shows the circle of Willis and can identify aneurysms and AVM. MRV: Consider if the bleed could possibly be a cerebral venous thrombosis with haemorrhage. CTA: Allows imaging of aneurysms and dissections and vascular malformations. Cerebral angiography (DSA): Reserved for selected cases in tertiary centres for those with SAH or AVM. There is a small probably less than 1% stroke risk associated with the procedure. Echocardiography: CRP and general work up if endocarditis suspected as septic emboli can bleed. The student often sees blood pressure as a cause of acute haemorrhage due to acute rises in blood pressure causing sudden vessel rupture and catastrophic bleeding. In reality hypertensive bleeds are the result of a chronic low-grade damage to usually the deep penetrating vessels over a number of years. These are the same vessels that occlude in the formation of lacunar strokes so it is no wonder that they occupy the same anatomical areas of the brain such as the putamen, basal ganglia, internal capsule, thalamus and pons and cerebellum. Hypertension likely is also a mechanism for the more superficial lobar bleeds though amyloid is also in the differential diagnosis too. The clinical presentation has already been discussed and need not concern us more here. 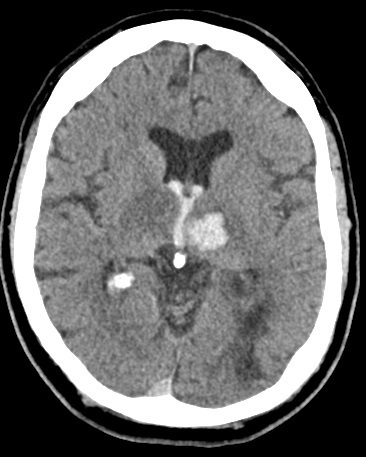 Non-contrast CT head is the imaging of choice and in an older hypertensive patient with a deep bleed no further imaging is needed unless there are other concerns as to the aetiology. All atypical bleeds that are not classically hypertensive or with an obvious cause need follow up interval scanning to exclude an underlying structural cause. The larger the bleed the longer it will take for the blood to clear. Immediate: The key clinical priorities will be early ABC and airways and breathing support and some patients may require early intubation and ventilation to allow assessment and imaging. For all early CT and treating any coagulopathy , BP control and neurosurgical referral is required. Some may need simply require palliation although end of life decisions should be carefully made or often delayed in the first 24 hrs. There are ongoing trials such as TICH-2 looking at the administration of the antifibrinolytic drug tranexamic acid (TXA) in patients with spontaneous intracerebral haemorrhage. All patients with SICH should be admitted to a HASU or ITU that provides specialist medical and nursing care and therapy skills. Once the patient is stable usually MR imaging is done at 6-12 weeks to look for causes. 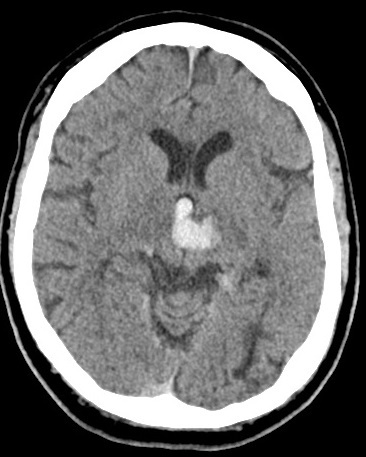 Ongoing care: They will need Multidisciplinary stroke care, regular Neurological observations - Temperature, Pulse, BP, GCS, Pupillary responses and the escalation of any worsening so that repeat imaging for further bleeding or hydrocephalus can be performed and intervention initiated as required. 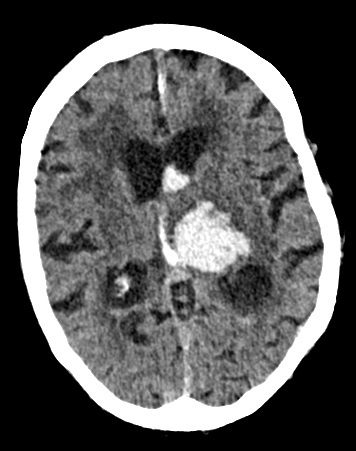 Delayed Presentation:When patients present more than 7 days after a stroke and the CT shows a hypodensity and no blood then it is wise to consider an MRI as the best imaging modality as this can give a more accurate determination as to whether this was initially infarct or haemorrhage which has resolved. 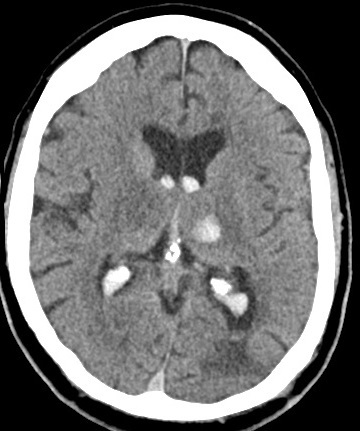 MRI sequences such as T2* and Gradient echo and SWI will detect the high levels of haemosiderin within a recent bleed. Neurosurgery: may have a role for some for Haematoma evacuation usually where there is falling GCS. The evidence for surgery in supratentorial bleeds is not strong but selected cases may benefit and cases should be discussed. 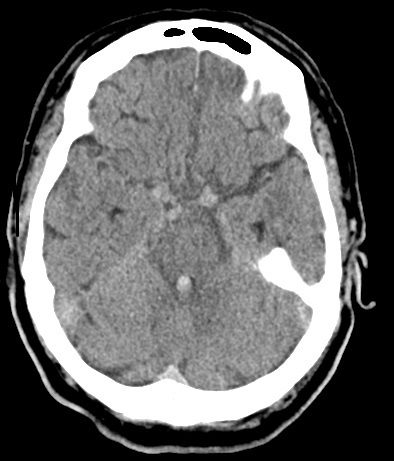 Always consult with neurosurgeons if there is a cerebellar haematoma which may need evacuation or in those developing hydrocephalus for external ventricular drainage (EVD). 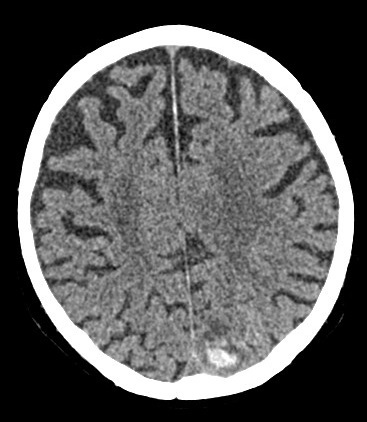 Infratentorial bleeds benefit from clot evacuation or shunt insertion for hydrocephalus especially if there are signs of developing coma and haematoma > 3 cm. Coagulopathy: If on warfarin and INR > 1.4 give IV Vitamin K 10 mg stat and Prothrombin complex concentrates or FFP e.g. OCTAPLEX/BERIPLEX (Vitamin K clotting factor replacement). Discuss with haematologists. Thrombocytopenia: All anti-platelet agents or anticoagulation must be stopped and coagulation normalised. Platelets should be given to raise levels about 50 x 109/L when bleeding time normalises and guidance usually suggests greater than 100 x 109/L although this is not evidence based. My own hospital guidelines suggest a target of 80 x 109/L as this helps to ensure that levels never fall below 50 x 109/L. Th evidence base for the 50-100 range is without evidence either way and needs more research. Platelet administration is NOT recommended in the setting of ICH on antiplatelets due to data from the PATCH trial where platelets worsened outcomes. This has made me concerned that platelets may be harmful in even those not on antiplatelets. We need more trials. VTE prophylaxis: in the short term IPC is the VTE prophylaxis of choice. 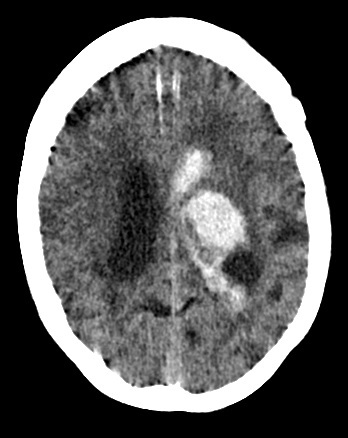 IV Mannitol:Intravenous mannitol should not be used routinely for treatment of raised intracranial pressure in patients with primary intracerebral haemorrhage. If used it should be as a bridge to surgery or some other definitive procedure. Metal Valves: Stop anticoagulation and switch to aspirin for a week and then consider restarting anticoagulant. Much will depend on size of the bleed, is there a recurring pathological process and other such factors. Evidence suggests that newer metal valves are less thrombogenic depending on the valve type and lower INR levels may be acceptable. Statins: Statins are often stopped as concerns about increased haemorrhage risk which is still being defined. For those at high risk of vascular disease a balance will need to be struck. Hyperglycaemia:Sliding scale if Blood glucose high. Tight control can lead to harmful episodes of subclinical hypoglycaemia.